We often stopped to read the signs about the historic mining buildings lining some of the ski runs at Park City Mountain resort. Visitors can take a free guided historic mountain tour and learn the history behind Park City. Tour guides provide a wealth of knowledge, as well as fun stories of how the runs got their names and behind-the-scenes vignettes from the 2002 Olympics. • $450 million in silver was mined at Park City Mountain from 1,200 miles of tunnels. • Park City’s silver mines produced 25 millionaires. The tour is offered 10 a.m. daily at the Eagle Statue in the plaza or at the Summit Demo Center at 1:30 p.m.
A light snow started in the morning and would continue off and on for the rest of the day. Not a heavy Sierra snow, but the fine, dry snow that Utah is famous for. Its flakes were just big enough to sting your face if you took off your face mask. Shooting by a terrain park we saw several boarders trying their luck on the jumps. Park City has three parks, including Eagle superpipe and Merrill minipipe. Late in the day, we caught some high winds at the summit, but it was fine once you skied down into the valleys. It turned out to be another great day in our Park City adventure. Park City Mountain offers 3,300 acres of skiing. There are also nine, count them nine, bowls with 750 acres. That’s a lot of territory to cover, and coverage was excellent when we arrived in February. We decided to warm up on Homerun, which turns out to be the longest trail, measuring 3 1/2 miles. Quite the warm-up. Park City actually has 114 trails, with more than half listed as intermediate, while 31 percent are advanced. The snow was a fine powder as we schussed under cloudy skies. At times, a pale white sun would barely pierce the cloudy veil, lending a cold, bleak light. But the skiing was hot. As in our visits to other Park City ski resorts that week, there were hardly any lift lines. Park City has a total of 16 lifts, including four high speed six-packs and three high speed quads. The mountain boasts a total uphill capacity of 31,000 skiers an hour, which would be tested on President’s Day that weekend with every hotel room booked solid. But we beat the rush and could ski as much as we wanted. We were often alone on our own section of the mountain. The Canyons is immense and glorious for intermediate and advanced skiers, with so much variety of terrain to choose from, it’s not to be done in one day. At least not for me and my group of nine. But there’s not much at Canyons for beginners. Just 10 percent of the trails are marked green, and those trails cover little of the ski area’s vast territory. The Canyons, one of the three major ski resorts in Park City, Utah, is four miles from downtown Park City and 32 miles from the Salt Lake City Airport. Several shuttle services offer transportation from the airport to the resort and to Park City for a reasonable price. Free public buses from Park City run all day between Park City and Canyons. If you like to ski groomers and opt to try Canyons on your own without a guide, pick up the daily grooming report at the base lodge. It’s invaluable. When I’m not familiar with a ski area and I’m by myself, I like to sign up for a guided mountain tour. 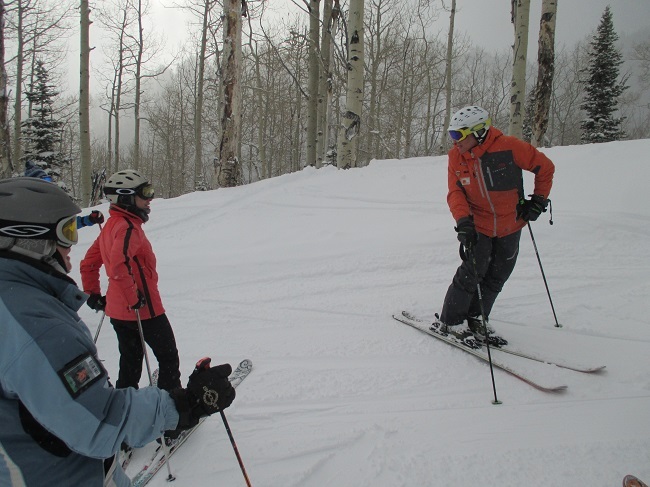 Canyons offers one daily at 10:30 a.m.
Mountain guides know which runs are groomed and which runs are suitable that particular day for their group. I find the tours enjoyable and informative. Plus, I get to meet people from all over the world. Our group of nine was a joyful band of good skiers who wanted to take it easy. No big bowls, no trees and definitely no moguls. Just nice, easy cruisers with good pitch and maybe some powder on the side. We were a group of West Coasters — California, Oregon and Washington. Seems we were all fleeing the dry conditions in the West for the more favorable Utah snow. Fortunately, we were graced with a fresh dusting of it — 6 inches of snow fell the day and night before, leaving a blush of powder over hard-packed groomed. We wanted to see as much of the area as possible — boundary to boundary, as one skier in our group put it. A hardy task given the ski resort covers nine peaks and five bowls with 4,000 skiable acres and counts itself among the largest ski areas in the nation. Roger Seaborn, our affable Australian tour guide, however, was unflappable. He took our request seriously. This was no tour for slackers. With 182 trails to choose from, we got busy. With Roger leading the way, we managed to find one or two of the best blues, groomed double blues, and a bit of powder off each lift, skiing nearly end to end and top to bottom throughout the resort. For those in the group who wanted a challenge here and there, Roger would stop on a run and point out another way down and we would all meet up at the bottom. One place we skipped was the double-black terrain off the resort’s notorious Ninety-Nine 90 Express (so called because it rises to the resort’s highest elevation at 9,990 feet). This is expert-only terrain. Roger told us a couple of out-of-bounds skiers had triggered an avalanche on a bowl just outside the resort’s boundary only two days before. Roger is also a certified instructor. Though it wasn’t part of the program, he offered ski tips to anyone in the group open to suggestions and improvement, which was all of us. Easier requested then accomplished. Roger was trying to get me to work on more rounded — and more graceful — turns. Others in the group he instructed to bend more at the knees, roll the ankles and lean more forward. I think the instructor in him just couldn’t help himself. If he saw one of us doing something, he first asked permission in a nice way if you minded a little instruction — then proceeded to offer his advice, which we greatly appreciated. “You’ve done 16,100 vertical feet and 31.7 miles,” reported Ed Kane during a mountain tour of Canyons Resort in Park City, Utah. He had one of those $400 fancy oversized wristwatch gizmos that tracked his every ski move and recorded it for posterity. Plus for backup, he had a $1.29 app on his phone that did the same thing. I’m not sure which one worked better. And since he and I skied on the same tour with the same guide, his end-of-the-day vertical was my vertical and his miles were my miles. I was so excited, I couldn’t wait to tell everyone I skied 31 miles in a day, and how much I enjoyed my excellent Canyons experience. Ed found my excitement a bit humorous and smiled as I went on and on. “Ah… half of that was on a lift, though,” Ed informed me. “So you mean I only went 15 miles?” I asked, thinking it didn’t sound nearly as impressive as the 31 miles I was already planning to post on Facebook. “No. You did 18.5 miles,” he said with what might have been a hint of laughter. If I had known Ed for more than the six hours we spent traversing the Canyons’ numerous slopes, I would have given him The Look. You know the one — the “Don’t get technical with me” look we reserve for those we know intimately. Still, 18.5 miles didn’t sound too shabby. I could go with that. It was my first time skiing at Canyons. Deer Valley Resort in Park City, Utah, is growing. President and General Manager Bob Wheaton announced recently the resort’s plan to add 1,000 acres of ski terrain with five or six new lifts. The new ski area will be located on the resort’s east side below the Sultan Express and Mayflower lift on Bald Mountain. With this addition, Deer Valley will offer more than 3,000 acres of skiable terrain. A new lodge, dining area and possibly lodging will be built in the new base area. Deer Valley has wanted to expand for some time, Wheaton said. On peak days the resort’s dining areas struggle to handle all the skiers. The expansion, he said, will alleviate much of the dining congestion and offer skiers another access point to the resort. The anticipated start date for the project is 2017. The project is expected to be complete in five years and cost an estimated $50 million. Also on the horizon is a new gondola from historic downtown Park City to Deer Valley. Another major ski resort, Park City resort already operates the Town Lift from one end of Main Street. Deer Valley wants its own gondola. The gondola will run from Main Street to Deer Valley’s mid-mountain Silver Lake Lodge area at 8,100 feet. The ride should take 15 minutes. A decision has not yet been made whether the gondola will be free or if there will be a small fee. The gondola project will begin within two years and cost $10 to $12 million, Wheaton said. All of this is great news for skiers and visitors to Park City. With a town gondola to Deer Valley Resort and a town lift to Park City Resort, skiers can skip the public buses and go direct from downtown to two of the area’s ski resorts. It’s easy to get to Deer Valley. It’s a 45-minute ride from the Salt Lake City Airport, and many transportation companies offer service from the airport to Deer Valley for a reasonable price. There are many lodging opportunities at Deer Valley — all are on the expensive side. 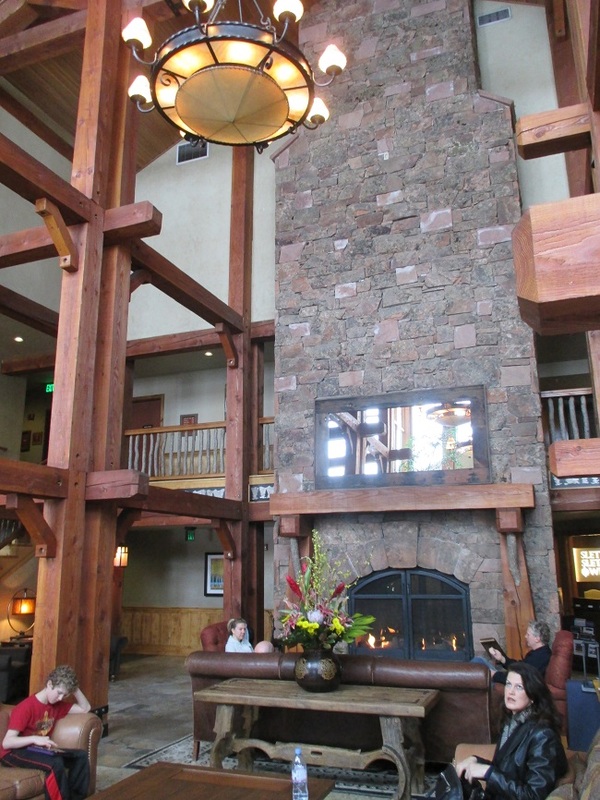 My stepdaughter and I stayed in a one-bedroom unit at The Lodges, a luxurious complex with a heated outdoor pool and hot tub, near Snow Park Lodge, Deer Valley’s main base lodge. 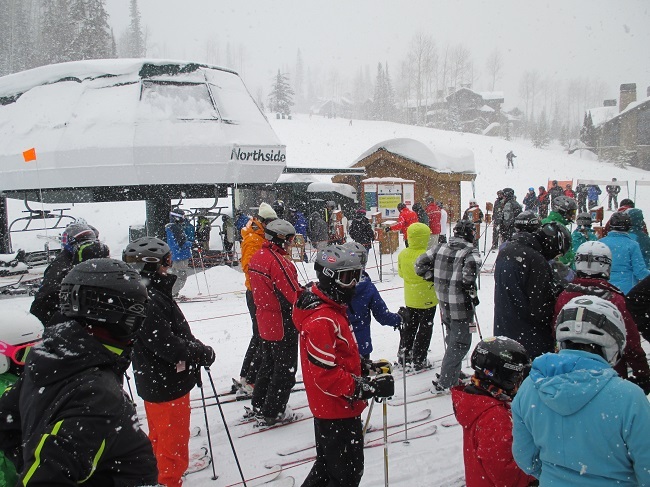 A free shuttle runs all day from The Lodges to Deer Valley and takes less than five minutes. Another plus at The Lodges is the free, on-call car service to anywhere we wanted to go in the town of Park City. Skiers can also stay in Park City and take the free local public buses to Deer Valley that run all day and pick up at several locations. On our second day of skiing at Deer Valley, the snowfall was heavy and wet, the kind of ski day that leaves your jacket and gloves soaked. But that didn’t keep us from discovering and enjoying more of the resort’s beautiful blues and blue-greens, Deer Valley’s in-between groomers that challenge beginners and give intermediate skiers an easy final run at the end of the day. Beautiful and easy. That’s Deer Valley. 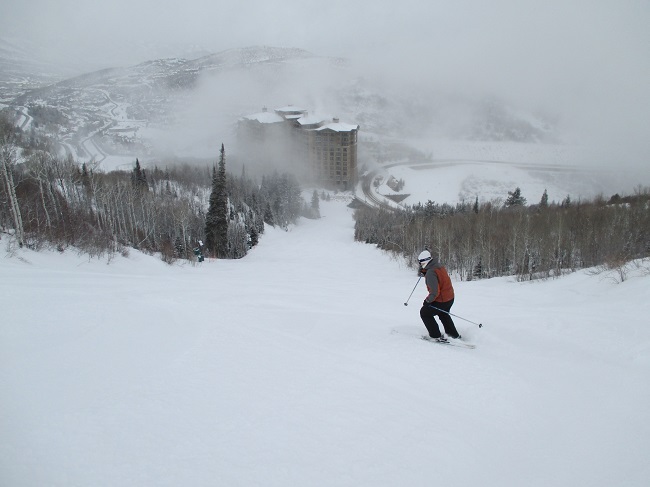 Deer Valley is a skiers-only resort — one of the few left in the country. And Deer Valley plans to keep it that way. “We survey our guests and (no snowboarders) is among the top reasons why people come to Deer Valley,” said Bob Wheaton, president and general manager. He says the resort is doing well financially with only skiers, and he doesn’t see the policy changing. No snowboarders made our skiing experience more relaxed. And quiet. Deer Valley is excellent casual skiing at its best. This was the trio’s third trip to Deer Valley in three years. The two friends from Texas, whose husbands don’t ski, have been skiing together for many years. Lauren joined them three years ago for their annual ladies-only ski trip, and Deer Valley is their go-to destination. It’s also the favorite of Amy and Bill from Austin, Texas. The couple returned to Deer Valley for the second year with their two young children, 7-year-old Ben and Caroline, 9. The parents felt the resort was ideal for their family. Ben’s favorite trail is Ontario, a long green groomer running from the top of Flagstaff Mountain. “We’ve been doing that all day,” Amy said with a sigh. The parents also like the kids ski school program. children. The resort offers a nice discount for seniors 65 and older at $77 a day. Deer Valley ski resort is elegance personified. You get that message when you find a new Cadillac sitting outside the lodge. As if the beautiful log lodge wasn’t enough. And old chairlifts served as porch swings on the verandah. I found it hard to hit the slopes, when I checked out the plush interior with its club setting. 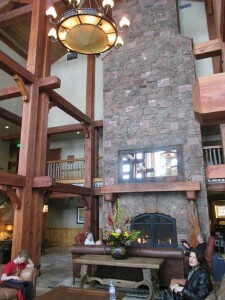 The leather chairs and stone fireplaces reminded me more of a plush country club, than a typical ski resort. But that’s just the impression that Deer Valley is trying to make. It caters to the well-heeled such as an Orange County couple who were married here 17 years ago, and had returned for Valentine’s Day. Even the “cafeteria” looked amazing, with a live carving station and natural food bar. The resort had just hosted the FIS Freestyle Ski World Cup in January. U.S. aerial and moguls teams answered questions, while Columbia l unveiled the 2014 Olympic uniforms for the U.S., Canadian and Russian freestyle ski teams. The rest is history, with the U.S. freestyle winning gold, silver and bronze medals in the Sochi Olympics. While I’m not Olympic material, I thought it would be interesting to ride the same mountain that our champions had practiced on . So I forced myself back outside to catch my first run of the day. Choices, choices: Deer Valley can lift more than 50,000 skiers an hour with its gondola and a dozen high-speed quads. Add in the other chairlifts and you get a total of 21 lifts. Heck, I wouldn’t even be able to get to every lift in one day. With a base elevation of 6,500 feet and a summit height of 9,500, this gives skiers 3,000 vertical feet to play with. I say “skiers” because snowboarders aren’t welcome at Deer Valley. We worked our way around the mountain, enjoying the well-groomed runs. Beautiful homes lined many of the trails, forcing us to stop every once in a while to oogle celebrities’ homes. Bald, Flagstaff and Empire mountains all top off above 9,000 feet, so good luck if you’re coming from sea level like I was. Give yourself a day to acclimate and you should be alright. Deer Valley averages 300 inches of the “Greatest Snow on Earth” blanketing its six mountains – Little Baldy Peak, Bald Eagle, Bald, Flagstaff, Empire and Lady Morgan. Skiers of all abilities will enjoy a wide range of trails. We stayed on the blue trails and away from the black ones because we didn’t want to land up black and blue at the end of the day. Mother Nature cooperated with temps in the 30s under partly cloudy skies. On many runs, we were the only skiers in sight and we never had to wait in line at the lifts. A friend from La Verne decided to take a ski lesson. She was impressed by the quality of instruction and shared many of the instructor’s tips with me in the afternoon. At the end of the day, we were sad to leave, but glad we had come. Headed home, we congratulated the Orange County couple and wished them another memorable Valentine’s Day. At Park City ski resort, we had a little bit of everything — wind, snow, fog — but we still had a great time exploring this getaway nestled up against the city with the same name. You can actually catch a chairlift from town, which must inspire a lot of residents to call in sick on a powder day. Actually, the bosses probably plan on it. We joined in the fun at the lovely ski plaza at the base of the mountain. It looks very new with shops, restaurants and services on the first floor and lodging on several floors above. We gathered at the golden eagle statue for a group shop before heading up. 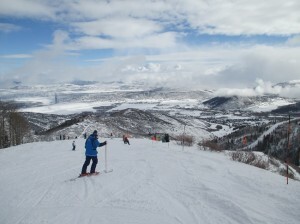 Park City Mountain offers 3,300 acres of skiing. There’s also nine — count ’em, nine — bowls with 750 acres. That’s a lot of territory to cover with the fine, dry Utah snow, but coverage was excellent when we arrived. We decided to warm up on Homerun, which turns out to be the longest trail measuring 3 and a half miles. Quite the warm up. The snow was fine as we schussed under cloudy skies. At times, a pale white sun would barely pierce the cloudy veil, lending a cold, bleak light. Once again, it was ski down, jump on another empty chairlift and shoot back up to the top. Park City has 16 lifts, including four high-speed 6-packs and three high-speed quads. The total uphill capacity is 31,000 skiers an hour, which should be tested this Presidents Day weekend with every hotel room booked solid. But we beat the rush and could ski as much as we wanted. We were often alone on our section of the mountain. A light snow started and would continue off and on for the rest of the day. Not a heavy Sierra snow, but the light, dry snow that Utah is famous for. Its flakes were just big enough to sting your face if you took off your facemask. Caught some high winds at the summit, but it was fine once you got into the valleys. It turned out to be another great day in our Park City adventure.